This is our first participation in the Caspian Ecology exhibition, and we hope that our rich experience in the field of water resources will be in great demand in this rapidly developing country. In particular, we can hold consultations on oil spill risk management and provide advanced monitoring tools and effective engineering services. Based on my own experience, I am very much convinced of the need to safely use drilling platforms in order not to harm the environment. We have already had negotiations on the safety of the work of the platforms with SOCAR experts, and most likely, will meet with experts of BP (operator of key oil and gas projects in Azerbaijan). 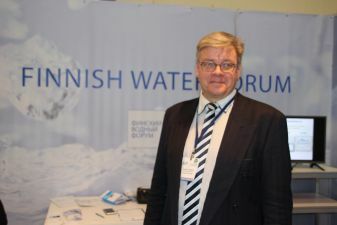 FVF was founded in 2009 by commercial enterprises, governmental and non-governmental organisations, academic institutions and associations whose activities are related to the water sector. FVF serves as a contact point for any inquiries regarding water know-how - regardless of whether it is related to industry, technology, science or management. Finland, where 190,000 lakes and 650 rivers are located, pays serious attention to the protection of water resources. Internationally recognized Finnish expertise is used in challenging arctic climates. In addition, the Finnish innovation system provides water and environmental innovation with a strong IT technology sector. As a result, Finland is among the leaders in a healthy environment and has the cleanest water to drink and for other needs.